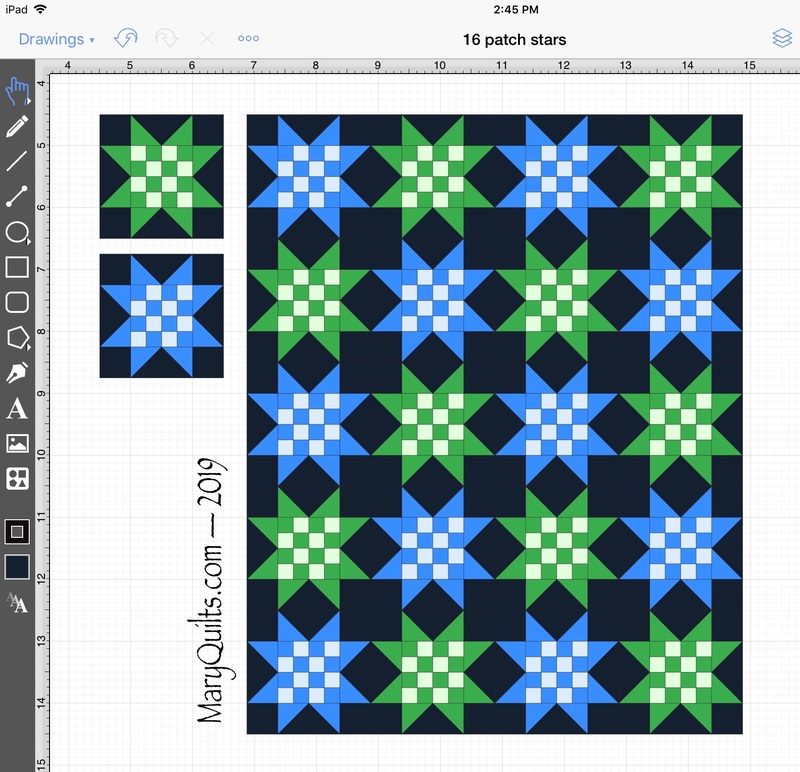 Today was a travel day and since I had plenty of time to kill on the trip home from Jamaica, I played around with some ideas for 16 patch star quilts. For a 12 inch finished block, the squares in the 16 patch would be 1.5 inches finished (2 inches with seam allowances) and the half square triangles would be 3 inches finished (3.5 inches with seam allowances). 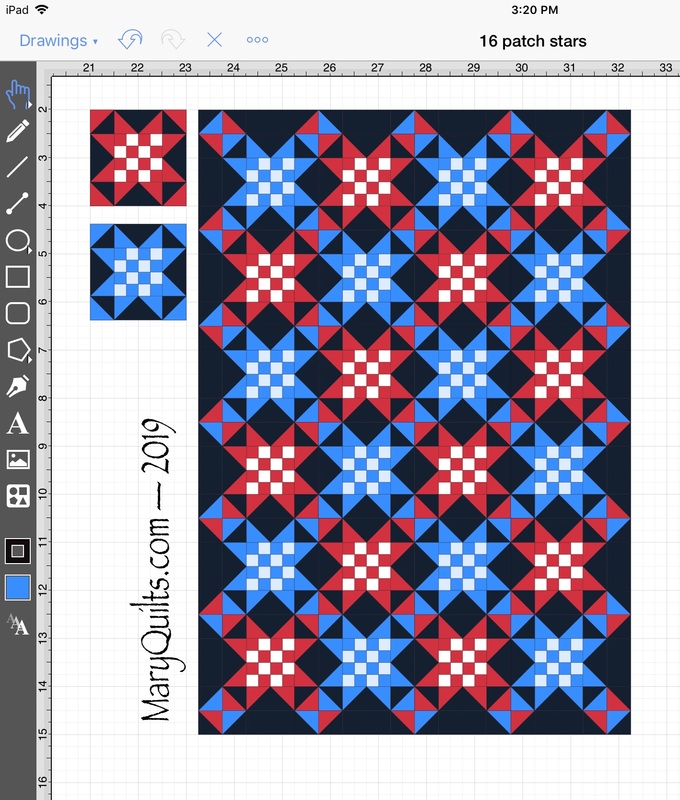 For a larger quilt with a 16 inch finished block, the squares in the 16 patch would be 2 inches finished (2.5 inches with seam allowances) and the half square triangles would be 4 inches finished (4.5 inches with seam allowances). And how about a RWB one? This one is a little more complicated, but more interesting too. The pieced border continues the pattern to the edges. I’m looking forward to being back in the sewing room but probably not this weekend … I’m very tired and Keith travels Monday so we’ll probably have a relaxing weekend … once Finn calms down after getting home in the morning! I like big blocks, I can not lie …. are you singing it with me?! I’d like to try this one as a 12 inch block but it might not look as good. Here’s a draft of a RWB version for a veteran. I put borders on it but you could also just make 35 blocks and set them 5 x 7 for a quilt that is also 60×84 or use a smaller 8 inch block if you’d like. The inner border on this one is cut 2.5 inches and the outer border is cut 4.5 inches. I’ve got a set of fat quarters and might make a scrappy kid’s quilt with 20 blocks, set 4 x 5 and finishing at 48 x 60.